Another cute and easy angel, but this one also uses wallpaper pieces. There are patterns for the gown and wings. Supplies needed include pieces of wallpaper, cardstock, glue dots and glitter glue. You could make a whole choir of angels in no time flat. The directions for the “Wallpaper Angel” are in the 3rd Grade Projects Gallery in the sidebar. 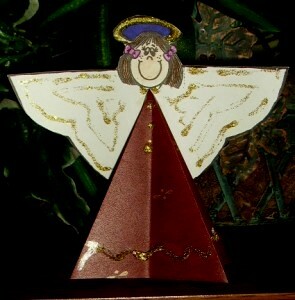 This entry was posted in 3rd Grade and tagged 3rd Grade, angel crafts, christmas angel crafts for kids, christmas angel projects, easy angel crafts, wallpaper, wallpaper angel. Bookmark the permalink.